KAÑA Tapas Bar - October 20th, 2002. DeeJay Babaloo "el mago" was working his magic at KAÑA Tapas Bar & Restaurant on October 20th, 2002. The night was hosted by Ralphie "la rumba" of Rumba Dance Productions and DeeJay Babaloo. 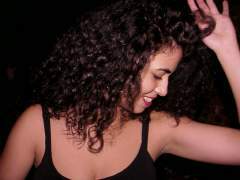 KAÑA has been adopted by many of New York's best dancers because of Babaloo's magical mix of Latino sounds. These photographs were taken on October 20th, 2002 by J. Fernando Lamadrid at KAÑA Tapas Bar in New York City. All photographs on these pages are copyright justsalsa.com NYC 2002. All rights reserved. Your feedback is welcome.